The de Havilland Heron was developed for the post WWII airline market operating as a feeder liner and secondary route stalwart. These aircraft served throughout Australia and New Zealand with New Zealand’s National Airways being the lead customer for the aircraft in 1952. Powered by de Havilland’s Gipsy Queen engines the Heron often replaced civilianised Lockheed Hudson's or ageing DH86’s and bought a considerably upgraded standard of service to the passengers of Butler Connellan and Northern Airlines. The aircraft operated widely throughout Australia, from Darwin to Hobart and west to Perth. 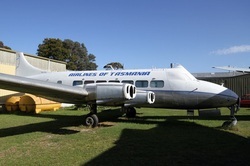 Herons last Australian airline service was with Airways of Tasmania who operated six Herons from Launceston, all were re-engined with Lycoming engines and serviced the northern coast of Tasmania and King Island. A large number of Herons were fitted with the Lycoming engines resulting in a considerable performance increase with payload, and cruising speed being markedly improved. Some 148 Herons were produced and de Havilland's failure to develop a successor to the venerable Gipsy Queen engine or the DH114 Heron saw it lose a valuable market.